My Secret Little Project. New Story Cards! It's been awhile since we've had new story cards. I believe there is a demand for new ones. So... I'm going to flex my creative muscles and make some! Here is a link to current download! Here is a preview of one of them! Stories don't really have a lot of impact on the way the game is played. Conspiracies... such as they are, kinda scratch that itch, but most fall below the bar of compelling. So, I wanted something that impacted the "how and who" of committing. Making difficult choices even more difficult. Also, I wanted to be as flavorful as possible. From what I understand about this story, is that people took over the City of Sarnath, former home to the Ib. They enjoyed some good times. Eventually, thanks to Bokrug, the tide reclaimed the city from the invaders. Those that stayed, met their doom never to be seen again (show by the Fated X for those the remain around story for too long), and those that didn't fled in madness (if a character goes insane, they're removed from the story, thus escaping the wrath of Bokrug). No story card to my knowledge, even though they appear to be passive effects, have passive effects. Instead, they're optional game effects. Conspiracies on the other hand kinda ignored this formatting and was never really fixed nor cared about as everything remained intuitive. Hopefully, with the way I worded it, it'll remain intuitive. The current plan is to release a "print and play" pdf file containing a complete 12 story cards. Free for download. That will act as a supplement to the official story cards, Should anyone like to 'shake up' their local game from the usual awesome story cards. However, I'm not where near done (just kinda whipped this first one up in the last few hours) so I may continue to post preview cards until I'm done. However, I'm essentially going to follow the posted chronological order of Cthulhu Mythos stories. Obviously there is more than 12, but, I also plan on making more than one set of 12 story cards should people continue to want them. So ladies and ghents, ya or nay? I like the idea. It makes me think about a discussion I had one time about the game, where we debated whether the game would be better if conspiracies were required in deckbuilding. The conversation went something like "The game starts with three generic stories with negligible effects, and deckbuilding required 6 conspiracies." Clearly a topic for a different time. But Stories that have passive effects on the game is a great idea in my opinion. 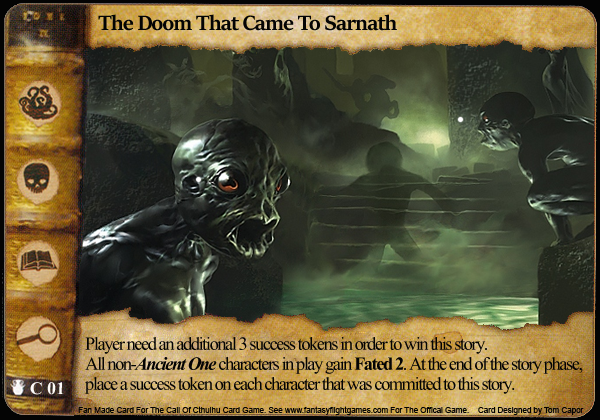 Might make a nice change from "win stories to win the game" into "win stories so I don't lose the game"
As a note, i believe sarnath was across the lake from Ib. The people of sarnath detested the beings of Ib, and went out to destroy them. They easily succeeded, and brought back a statue. Then they enjoyed peace and prosperity for 1000 years, holding a party and performing rituals of depravity in front of the statue on each anniversary of the victory. On the 1000th year the statue vanished, the lake rose, and the creatures pulled down everyone who wasn't smart enough to flee the party early. Been a while since i read that one. Maybe I'll go back to it. Was it 1000? Or 100? The things you forget. I think it's an awesome idea, so please continue! I also like your first story card and how you translated the original story into a game effect. Well done! Sounds like a cool project, I'd certainly like to have a set when they're done. Perhaps you can post a print & play version on Artscow or one of the other similar sites for people that want to order a copy on real card stock and you'd get 4 copies for one "deck" so you could share them with your local play group. Great initiative, Tom. Keep going - this story card is very interesting! Can't wait to see more. You see that FFG? You've been resting too long on your laurels - time to create another Story deck or your player base is gonna have to do it for you. If the reports are true of fewer champions getting to design cards, maybe contributing to a story deck could be a new perk. I think I'd rather see Champ-designed Stories over cards. Then you could see them in play more often, maybe everytime. That actually sounds like a cool idea, other then the problem of how to release them. Normally a new deck comes out every few years and replaces the old one in one shot. There's no established way to trickle them out and putting 1-2 in a box that are supposed to replace existing stories would probably upset casual players who feel that they're being blackmailed into having to buy every box or else they are no longer tournament legal. Maybe print on demand is a solution. Okay, I need to interject here. Maybe this question is naive but why does there need to be an official Story deck for the current tournaments that FFG holds? I mean, can't two contestants agree on which Story deck they want to use and then just go at it? What if they don't agree? If you do well in the tournament you can't really expect that EVERY opponent will agree with your selection, right? Somehow there has to be an official default at the least, and then if you have that why even bother with adding a negotiation at the beginning of each round. I think each player should bring 6 stories/conspiracies to a game and shuffle them together to form the story deck. Nice job Tom! Very evocative ability. It is quite wordy though. Could you explain the need for the wording "While this story is in play,..."? I feel that it is quite ridiculous that we haven't had new stories in so long! However as long as they continue to release new sets I won't complain too loudly ; ) Stories are the core focus of this game and a new innovative set of them would provide a nice shot in the arm for it. Keep'em coming! @ Unnameable: Does it need it? I don't think so and there's a good chance I'll remove it again before I'm done. I just wanted it to be super obvious that it wasn't a win effect and was instead, a passive effect. As for it's wordy-ness... well.. I'll work on that, but sometimes you need words to be do what you want to do. I'm a huge fan of "comeback effects" and the Lost City is full of it. Of course, first one there can usually dictate how things go, but choice of wither or not to contest and how much you want to contest all of a sudden becomes very interesting. The story of the Nameless City kinda revolved around a man searching the ruins learning all he could... until he dug a little too deep. That's the feel I wanted to showcase. 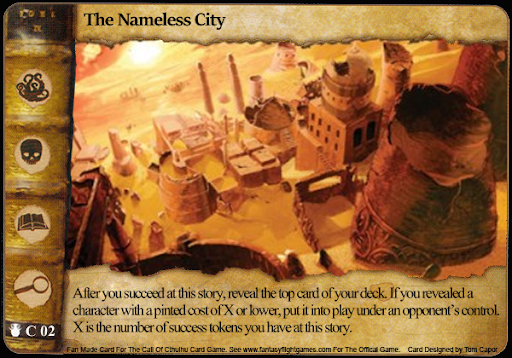 Each time you attempt to make progress at The Nameless City, could cause your own downfall. At first it'll probably be easy going, but as you dig deeper to unlock it secrets... it could come back to bite you! Well, I abandoned my whole.... chronological thing as it was brought to my attention that the list I was using was massively incomplete! So, in the interest of community interaction, I am now taking suggestions from the audience for any particular story or piece of media they'd like turned into a story card. As I'm typing this, I currently have 4 slots open in my opening 12 roster. I'm not going to guarantee that I'll use any suggestions made, but they'll all at least be considered. 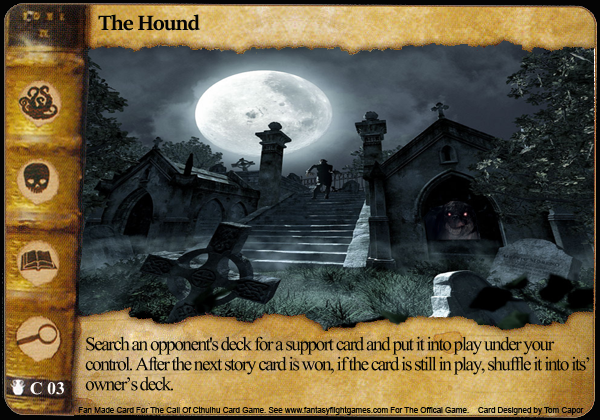 Is "The Hound" referring to the Hounds of Tindalos? I'd like to see a story themed around evading the Hounds of Tindalos. Both of these seem somewhat biased against rush decks, although perhaps stories with normal effects are biased in favor of rush decks. It might be nice to have a bit of both, but then match ups could potentially become quite swing-y depending on what stories are revealed. Either way, rush vs control is kind of balanced around stories that have a single effect when won, and these seem like they're changing that dynamic dramatically. Getting back to basics a little bit with a normal win effect. The Hound story is centered around a pair of grave robbers who get wind of a 'special grave' containing a valuable artifact. They succeed in obtaining the trinket, but are soon plagued by the howls of the hounds. Eventually the howls grow louder and closer... until.... the bauble is 'recovered' and 'returned' to it's rightful resting place. Winning The Hound allows you to take a potentially valuable treasure from your opponent who then begins to play the role of the hound feverishly trying to get it back and return the stolen item to its' rightful home. I'm having trouble finding good reference material for The Hounds of Tindalos, but decided to add The Colours Out of Space to the roster. Keep in mind, nothing is set in stone. That being said I have a few more previews to post tonight while I mull over the remaining cards to be put on the roster.